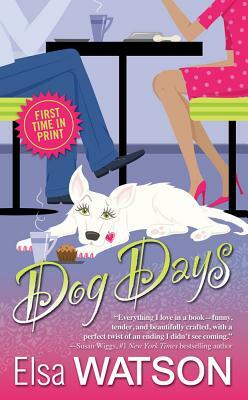 In Elsa Watson's "Dog Days, s"truggling cafe owner Jessica Sheldon volunteered to be the chairperson of Woofinstock, Madrona's annual dog festival, to overcome her reputation as "number one dog hater" in her dog crazy Northwestern town. Determined to prove her dog-loving credentials, Jessica rescues Zoe, a stray white German shepherd and in the process the two are struck by lightning. Jessica wakes to discover paws where her feet should be, and watches in horror as her body staggers around the town square . Zoe and Jessica have switched bodies. Learning to live as a dog is difficult enough, but Jessica's real worry is saving her cafe from financial ruin. To complicate matters, she's falling hard for Max, the town veterinarian. It's clear that Zoe is thrilled to live life on "human terms," thoroughly relishing all of the fun and food Woofinstock has to offer. But Zoe is also anxious to use her new human skills to find her missing family who may not want her back. And Jessica needs to confront a complicated figure from her past before she can move on with her life. From 1996 to 1998, Elsa Watson served as Peace Corps Volunteers in Guinea-Bissau, West Africa, where she began writing novels, all in longhand. She now lives on an island in Washington State with her husband, cat, and two dogs. Her short work has appeared in the "Writers Journal," "Snowy Egret, " and "Renaissance Magazine." Elsa is proud to live by the motto: any day on which you pet a dog is a good day.